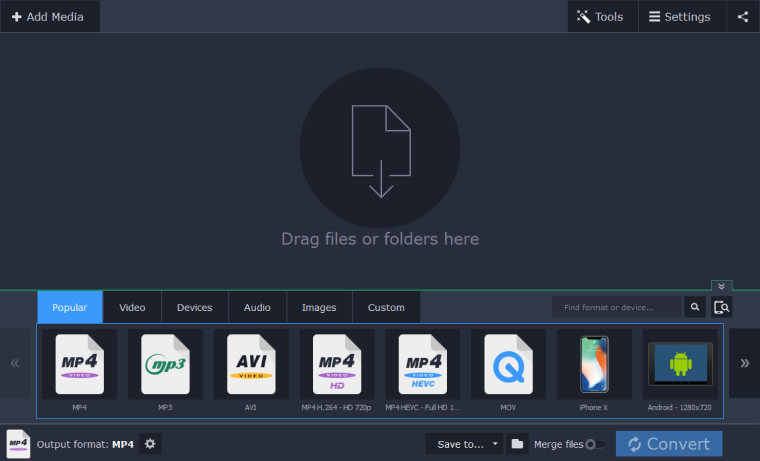 How to Convert a MOV File to MPEG Online? How to Change MOV to MPEG on Windows and Mac? MOV (QuickTime movie) is a file format created by Apple. Since this format was developed specifically for the Mac, users of other platforms may experience problems opening MOV videos. So if you want to watch your videos on any computer, it’s best to convert them to another format, such as MPEG (MPG). MPEG is one of the most popular video formats and was developed by the Moving Picture Experts Group. It provides good video quality and is widely used to store media data. You might try downloading a free MOV-to-MPEG converter from the web, but there’s a risk of getting a malware bonus. A much safer way to change media formats is to use our online conversion tool. Read the short guide below and convert MOV to MPEG online. Select MPEG as the output format. Your QuickTime movie file is over 100 MB? Try our premium desktop app! If you want to convert MOV to MPG or vice versa, SuperSpeed Video Converter is a good option. The software has an intuitive interface, so the process of conversion will only take a few minutes. 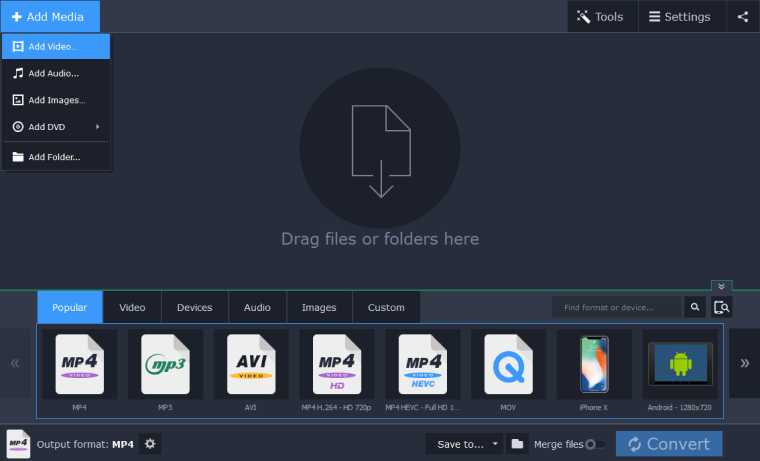 Just download the MOV-to-MPEG converter for Windows (XP/Vista/7/8/10) or Mac OS X (10.7 or higher) and follow the guide below to learn how to convert MOV to MPEG on PC or Mac. Download the installation file, then open it and install the encoder on your computer. After the installation process is complete, run the program. To add your videos to the converter, click Add Media in the top left corner of the program window, and then select Add Video. Or simply drag and drop files into the program. Click the Video tab in the lower part of the program window. To convert MOV to MPEG, select MPG. Next, choose the appropriate MPEG preset, for example MPEG-2 – Original Size. Hit the Folder button to specify the destination folder for the converted videos. Next, click the Convert button to start converting your files. 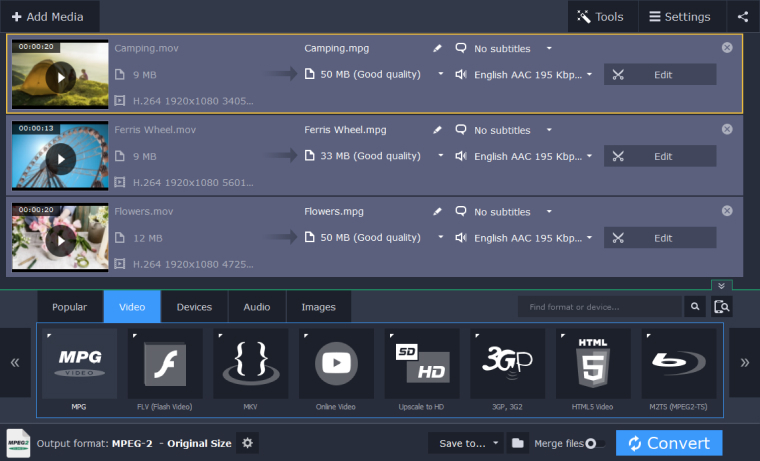 If you want to convert media files at a high speed and without losing quality, SuperSpeed Video Converter is the way to go. You can convert your files in most popular formats and also edit them – trim, rotate, delete sections, enhance and adjust colors, and more.